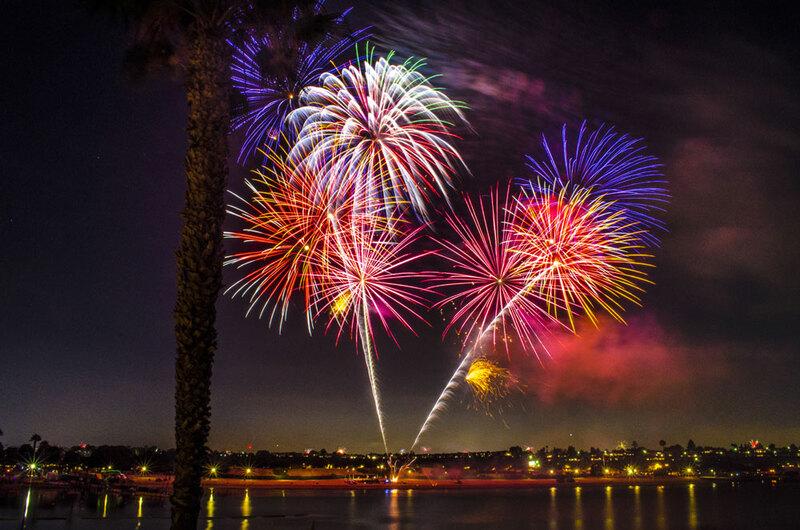 There is no better way to help celebrate America’s birthday than with fireworks at one of the many waterfront pyrotechnics shows scheduled throughout Southern California on the Fourth of July. Boaters will have the best vantage points for viewing these aerial displays. In addition to fireworks, boaters will find boat parades, barbecues, car shows and a variety of other activities to enjoy at harbors from San Diego to Santa Barbara. To help you with your holiday plans, here is The Log newspaper’s annual list of Independence Day fireworks shows and related activities that boaters can enjoy. Best Views: Aboard the 1898 steam ferry Berkeley, the tall ship Californian or the museum’s 1914 pilot boat. Fun Events: An Independence Day picnic dinner aboard the steam ferry Berkeley — $32 for adults, $18 for children — will feature barbeque chicken, burgers, cole slaw and more; first seating 5-6:30 p.m., second seating 7-8:30 p.m.); spectacular views of the Big Bay Boom fireworks display. The museum is also offering front row seats to the show aboard the museum’s 1914 pilot boat, Pilot ($40 per person). Passengers on Californian will experience the booming sound of the ship’s 6-pound deck guns as they are fired to signal the start of the fireworks show ($85 per person). Fun Events: A day packed with festivities starts with the 40th annual Crown City Classis 12K, 5L and kids hald mile fun run/walk at Tidelands Park at 7 a.m. Other events include a rough-water swim at Central Beach (check-in at 7:30 a.m.), Art in the Park (8 a.m.-4 p.m.), the 67th annual Independence Day Parade along Orange Avenue (10 a.m.), a Coronado Community Concert Band performance at Spreckels Park (4 p.m.) and fireworks viewing over Glorietta Bay at 9 p.m. Parking: At Scripps Park: Along Coast Boulevard and nearby streets in downtown La Jolla Village. At La Jolla Shores and Kellogg Park: Large parking lots are located next to the beach and park, and visitors can park along adjacent streets. Best Views: South Shore Park east of SeaWorld, Crown Point Park and Beach in North Mission Bay, Tecolote Shore Park in East Mission Bay, Ski Beach Park and Fiesta Island. Info: Fireworks Show provides a spectacular ending to Independence Day celebrations. Info: Boaters can enter the annual contest and decorate their dinghies (12 feet and smaller) in the most patriotic way possible. Trophies are handed out to the top four entries. Skipper’s meeting starts at 10 a.m. The parade can be seen from the municipal fishing pier, the Jolly Roger docks, the grass lawns along the harbor and from Dolphin Dock. Best Views: Fireworks are shot from a barge outside the harbor, so boaters in Dana Point Harbor have some of the best views. Heritage Park and Lantern Bay Park are also good viewing points. Fun Events: Dana Wharf Sportfishing is offering a fireworks barbecue buffet dinner cruise from 7:30-9:30 p.m. ($84, free for children ages 2 and younger) and a fireworks-only cruise from 8-9:30 p.m. ($29, free for children 2 and younger). When: Activities from 2-9 p.m., fireworks start at 9 p.m.
Fun Events: This 57th annual all-day event is geared towards families and will include live music performances, food presentations, activities in and around the water and a spectacular pyrotechnic display. Two stages will be set for five different bands who will play from 2-9 p.m. Moe B’s Aquatic Park offers a wide range of inflatables and water trampolines, rock climbing walls and massive teeter-totters ($25 for two hours). Back Bay Bistro Buffet will offer two seatings from 4:30-6:30 p.m. and 7-9 p.m. ($45 for adults; $22.50 for kids 10 and under).A fireworks spectacular will cap off the event at 9 p.m. Parking is $50 per car. A premiere private viewing area will be available for adults 21 and over for an additional $40 per person and that includes access to the hosted Beer & Wine Garden from 3-8 p.m.
Boating Info: All boaters are invited to decorate their vessels and participate in American Legion Yacht Club’s yacht parade. Fun Events: Pancake breakfast 9 a.m.-noon ($10); barbecue lunch noon-4 p.m. ($10), and live music and dancing 1-5 p.m.
Fun Events: The annual golf cart parade down Crescent Avenue will be lead by the University of Southern California Matching Band this year. A barbecue and buffet dinner, along with music, can be enjoyed by guests at the Casino Ballroom’s balcony, overlooking the fireworks display. Fireworks will begin at 9 p.m. over Avalon Harbor. Fun Events: A fireworks spectacular is set to blast off over Isthmus Harbor, beginning at dark July 3. On July 4, boaters are invited to decorate their dinghies in the most patriotic way possible, and participate in a parade through Catalina’s West End coves. Prizes will be awarded to the most creatively decorated dinghies. The 29th annual Children’s Festival will feature crafts and activities from 10 a.m.-noon. Fun Events: The three-day event will feature food vendors, live entertainment and family activities every day from 10 a.m.-9 p.m. The Fourth of July events include the Surf City 5K Run and Fitness Expo (7 a.m.-noon), the 111th annual Fourth of July Parade (10 a.m.-noon) and the grand finale fireworks display shot off the end of the pier, beginning at 9 p.m. When: July 4-5 11 a.m-10 p.m.
What: Live entertainment and DJs. A fireworks show can be enjoyed at the Belmont Veterans Memorial Party on the Pier event ($10 for adults, kids free with paying adult). When: From 2-11 p.m. July 4, fireworks begin at 9 p.m.
Fun events: A turn-of-the-century Traveling Circus tops the list of attractions and includes vintage performers, carnival games and train rides. Visitors can flap and Lindy Hop through the 1920s at the Gatsby Garden Party where professional dancers will set the stage. Step into a prohibition speak-easy where a secret password is the ticket to Crazy Rhythm live jazz and cabaret featuring the Satin Dollz. The Queen Mary’s salute to the 1940s and WWII will showcase Peter Jacobs Wartime Revue and live performances by the USO Dollz and the Swingin’ Hollywood Hot Shots. The decades roll-on with the Nifty Fifty Drive-In Diner playing authentic ’50s jukebox hits, Motor City Magic live on stage paying tribute to Motown’s greatest, the Disco Kings groovin’ through the ’70s and a day flow ’80s arcade. Round out the century with a 1990s laser tag rave and Country music tailgate. Themed dining, era-specific libations, strolling entertainers and family activities also planned for the event. Fireworks begin at 9 p.m. General admission tickets are $44 online/$49 walk up for adults, $25 online/ $29 walk up for children ages 12 and younger. Adult VIP admission, are $99. When: 5-10 p.m. July 2; fireworks at 9:15 p.m. Parking: There will be parking at Harbor Boulevard and First Street, and Ports O’Call Village. A free shuttle to downtown San Pedro will be provided. Fun Events: More than 100 classic cars on display, live music, food trucks and a beer garden, and fireworks. When: July 4; 9 p.m.
Best Views: Waterfront sides of most hotels, restaurants, beaches, apartments and anchorages throughout the marina. Fisherman’s Village, Burton Chace Park and Marina Beach are popular spots to watch the 20-minute fireworks show. Boating Info: Vessels are allowed to idle in the main channel, but anchoring is prohibited. Boats are not to enter designated fallout zones near the fireworks launch site. Fun events: The Marina del Rey WaterBus will be in operation from 11 a.m.-midnight July 4, to provide a waterside shuttle to seven locations throughout the harbor. When: Gates open at 2 p.m. July 4; fireworks at 9 p.m.
Fun Events: The annual event includes food and beverages, swimming in the lagoon, arts and crafts, a DJ, a big slide and obstacle course. Fireworks will be launched 300 feet off the lagoon starting at 9 p.m., timed to patriotic music. When: July 3-5. Fireworks at 9 p.m. July 4. Fun Events: Channel Islands Harbor has tacked on an extra two days of festivities in celebration of the harbor’s 50th anniversary. The fun begins July 3 with an assortment of Arts & Crafts vendors, and live entertainment at Harborview Park from 4-6 p.m. July 4 festivities begin with a 10k and 5k fun run/walk begins at 8 a.m. along Sunset Lane, Hollywood Beach, with registration at 7 a.m. The annual Children’s 4th of July Parade begins at 10:30 a.m. and proceeds from Albacore Way up to Harbor Blvd. to Cabezone Circle. Marine Emporium Landing will have activities beginning at 10 a.m. and include a farmer’s market, live music and children’s activities. Then, visitors can enjoy the fireworks at 9 p.m. On July 5, enjoy an expanded Farmer’s Market from 10 a.m.-2 p.m. and live music from 11 a.m.-1 p.m. in Harborview Park. Fairy Tales in the Park will provide live performances beginning at 2 p.m. When: 3-9 p.m. July 4 Fireworks begin at 9 p.m.
Fun Events: Festivities at the Santa Barbara waterfront include food vendors, a variety show and a fireworks display lasting 18 to 20 minutes. Music for the celebration will be simulcast on radio. A variety of other Independence Day celebrations are planned citywide.